As we approach the end of the calendar year, many of us are starting to think of and plan for the new year. While I'm not a big fan of wasting today, making plans for tomorrow – planning and record-keeping are important parts of a homespun and D.I.Y. life. Journals and records serve not only as a factual recording of our days but as a tool for learning what worked, what didn’t, how to improve, and a place to keep memories stored. The great thing about learning how to create a homesteading journal is that it doesn’t have to look like anything specific and can (and should) be as individual as the person doing the record keeping. This is not scrapbooking necessarily, though that can indeed be a form of record keeping. We’re recording our adventures, our gardens, our recipes, and much more and whether or not we record actual emotions, the recording of the event will likely help us hold onto the memory and will indeed bring those memories to the surface when we refer to those notes later on. When we embark on a fiercely D.I.Y. and homesteading lifestyle, we’re often going off the beaten path. This path still needs a map and it is up to us to create that map as we go along. It is through keeping records that we create our own individual maps. We keep records to remember that the apple cider tastes better with brown sugar than it does with white. We keep records so that we know we go through approximately 1 pint jar of salsa a week, so that we know how much to put up next year. Records remind us that mint tea helped with the upset stomach and valerian root worked better than chamomile at helping us get to sleep during periods of stress or anxiety. Sure we might remember these things in the backs of our brains, but having it written down and easily accessible means that we can always find it without having to try and dig out from underneath the pile of other things we’re trying to remember on a daily basis. We keep records so that we can understand how much time those squash really need to ripen in the garden versus what the seed packet states. We keep records because the recipe calls for parsley but we as a family prefer basil and the basil substitution worked beautifully. Record keeping means that while we are doing it ourselves, we’re also using our very personal experience to map our course and stick to our priorities on a daily and seasonal basis. The homestead journal is the compass from which we build skills, create tricks that make us more efficient, save us time, and keep our priorities from slipping from our grasp. There are no set standards, of course, but a good rule of thumb is to keep track of anything that might need remembering. Never trust the brain to remember all the important, little details with everything else that happens in a day. It’s also important to keep all those records contained in a system that works for you and can easily be accessed on any given day. A good way to break into record keeping is simply to track adventures and projects. When creating a new infusion or herbal remedy, simply track the ingredients, amounts, timing, results, effectiveness, etc. During foraging adventures keep track of what plants are blooming or fruiting during which outings. This will give a general time frame with which to shoot next year (taking into account different weather patterns). A homesteading journal can be a sterile spreadsheet, an art journal full of color and mixed media, or some combination of the two. There’s no right or wrong and there’s no reason why the same book can’t contain very sterile recordings of rainfall and recipes along with photos of recipes on other pages and notes about that red-tailed hawk spotted on a foraging adventure in the margins. There’s also no rule that it has to be an actual journal or book. Use technology if you’re so inclined (make sure to have back-ups, of course). I personally keep several different types of journals so that like subjects are kept together. I keep a small book for recipes, another for garden and food preservation records, yet another for herbal remedies, and a small daily to-do list planner notebook. That might not work for everyone but it does for me. If you're inclined to write in books, they don't need to be expensive leather bound books, unless that's what you prefer. Plain old composition books work great as do three-ring binders and regular notebook paper. 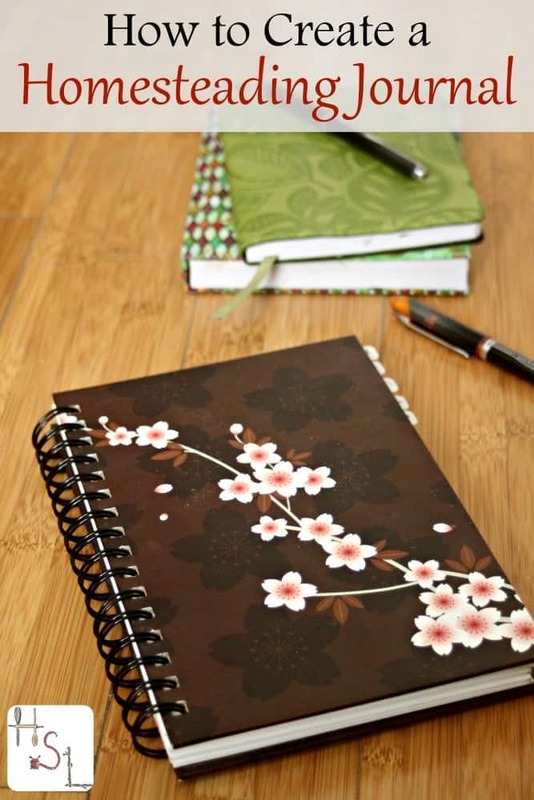 Remember – customize and create a journal and a record-keeping style that works for your life, how your brain works, and what is fun and low-stress for you. The Gardening Notebook is part garden journal and part garden resource. The notebook has plenty of space for recording garden notes, harvest records, and more all while also providing plenty of information about planting, pest problems, and much more. It's a great to way record thoughts and also problem solve at the same time. If you're looking for something to simply print out and fill in as you go about your homestead and homemaking duties, the Homestead Management Printables are for you. These amazing printables help track expenses, harvests, food preservation efforts, and so much more. There are also planning pages and a beautiful calendar. This is such a good idea. Sometimes I write hand notes and stick them places. Then I forget where I put them. It is so true about the harvesting time in your area may really different than the package. Even germination time. Taking notes helps a lot with these type of gardening functions. Thanks for the reminder. Thanks so much for stopping by and the invite.